Having the opportunity to explore water on a grand scale, with such a diverse range of quality, open-ended materials, is both exciting and challenging for children. These water play resources offer many ways to engage children in problem solving as they find out about how to move, redirect, capture and transport water. Children will become deeply absorbed in problem solving. Water play offers fantastic provocations to support and extend children’s language for thinking, science, maths and mark making – creating an essential every day resource. This ready-made collection comes complete with all the resources children need to investigate water outdoors. 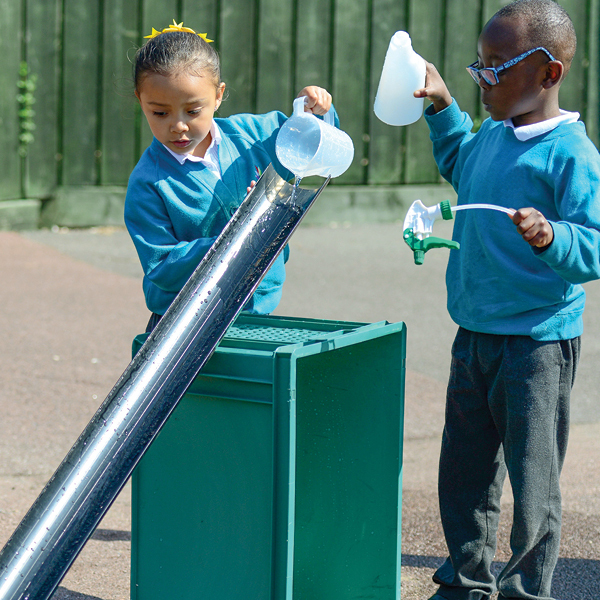 It includes carefully chosen, large-scale equipment that children will delight in using as they explore the properties of water and how it flows. Making the collection accessible to children is easy using the storage containers provided. Set of Jugs–1 x 1pt, 1 x 2pt and 1 x 3.5pt Jugs – this set of jugs are great for use outdoors and will encourage children to think mathematically as they play. 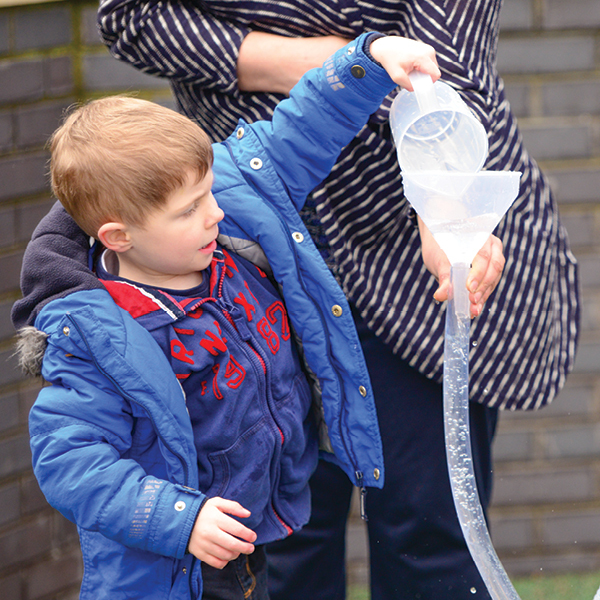 Funnels– 1 x 13cm funnel and 1 x 18cm funnel – Water Play with funnels allows experiments with the flow of water and will establish stronger motor skills. Children can experiment with how to gauge filling and emptying containers. Green Containers – 2 x Large Green Container –75 x 45 x 18 cm and 1 x Medium Green Container – 75 x 45 x 12 cm – strong & durable, stackable, made specifically for outdoor use. The perforated sides allow the air to flow around the resources helping to keep them fully aired whilst stored – good, for example, for water play resources which will become damp if stored in an air tight container. Set of Pipes and Bends– Black Drain Pipe in a range of sizes – 1 x Black Drain Pipe 150cm x 40mm, 1 x Black Drain Pipe 100cm x 40mm and 2 x Black Drain Pipe 50cm x 40mm. Black Swept Bend -1 x 92.5 o and 1 x 135o . This set of pipes and bends in a range of lengths and widths extend your resources and how your children experiment with the flow of water. Black Gutteringin a range of lengths and widths including – 1 x Black Square Guttering 100cm and 2 x Black Square Guttering 150cm, 1 x Black Round Guttering 100cm and 1 x 150cm, 1 x Black Round Thin Guttering 80cm and 1 x 120cm. These materials are heavy duty, durable and long lasting. Perfect products to study the flow of water. Set of Large and Small Green Trugs– 1 x Large Green Shallow Trug – 16cm height x 57cm diameter, holds 35L and 1 x Small Green Trug – 23cm height x 33cm diameter, holds 14L. These high quality Green Trugs are a staple in your outdoor area as their uses are endless and abilities limitless – they make ideal containers for collecting water as it falls from guttering, pipes and tubes and their flexibility enables easy stackable storage for your outdoor area. Set of Marble Bowls – 1 x 10”, 1 x 12”, 1 x 14”, 1 x 16” and 1 x 18” – set of five green marble bowls, graduated in size for children to use for filling, mixing and washing. 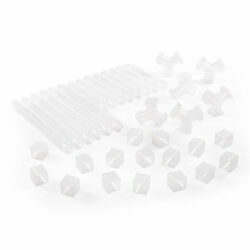 Large Clear Tubing x 5 – 19mm diameter – This strong, transparent tubing cut into 1m lengths will stand-up to the rigours of everyday use, enabling children to explore movement and investigate how water flows. 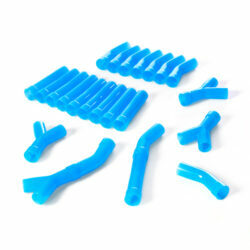 Set of Tubes and Pipes– 7 x transparent tubes, 5 x transparent connectors, 10 x blue connectors – This fantastic set of flexible transparent tubes and blue connectors brings greater challenge to children’s play. From changing speed and turning corners to finding out how water can be made to flow in multiple directions, this set will provoke investigative play and problem solving. Set of 4 Large Acrylic Basters – graduated tube with oz and ml measurements – perfect for measuring water levels, transporting liquids, investigating flow & direction and mark making. Set of Bowlsand Set of Buckets – 1 x Small 9.5L Silver Rectangular Bowl 38 x 14 x 32cm –and 1 x Large 12L Silver Rectangular Bowl 42 x 17 x 33 cm. 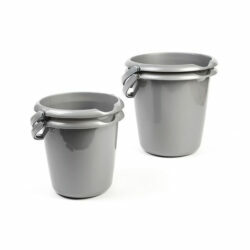 Set of 2 x 5L Silver Buckets. This set of two bowls and two buckets in different sizes are perfect for children to pour into and catch running water along with investigate weight and measure. Set of Wooden Paint Brushes– 1 x 3” and 1 x 4” and 1 x 8” Wooden Paper Brushes with Grey Bristles for use with mark making. Set of Sprayers– This set of 3 green topped reusable sprayers are easy to use and develop stronger motor skills. Great for mark making and investigating. Jerrycan – 44.5cm x 16cm x 38.5cm – This 20 Litre Lightweight Plastic Water Container comes complete with handy tap. The container has a wide range of uses and is ideal for carrying water. Red Bristle Wooden Brush– 76cm – This wooden brush is the right length for children to manage and the stiff red bristles make this ideal for exploring outdoor water play and mark making. 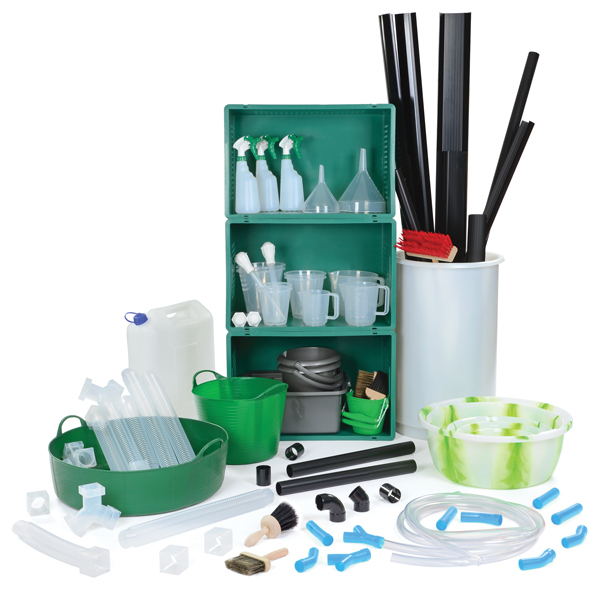 Set of Green Buckets and Transparent Pots – Featuring a range of sizes – 2 x small, 2 x medium and 2 x large pots and 2 x green scrunch buckets. 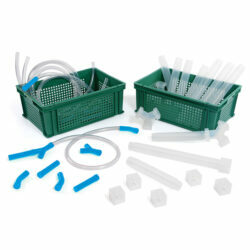 These buckets and pots are great for transporting water, filling and pouring. Tall Storage Tub– 645mm x 430mm – 73 litres, stackable and can be used for anything from storage to building structures and water play.